While most of us prepare to settle in for the long, dark winter ahead, it is comforting to see Bell focusing on the warmer days to come. 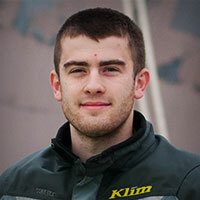 Kick starting our imaginations is the new Bell MX-9 motocross helmet. As the name would suggest, the MX-9 is a mid-level dirt bike lid based on the architecture of the flagship Moto 9 helmet. Where thee Moto 9 is a fiber composite shell construction, the MX-9 is a lightweight polycarbonate shell which allows for an affordable entry into the upper echelon of motocross helmets. The MX-9 incorporates three different shell and EPS sizes for a personalized fit, which is a nice feature to see at this price point. Inside, we see Bell’s traditional X-Static Silver anti-microbial and moisture wicking liner, plus cheek pads with a magnetic emergency release system. To spice up this new product line, Bell has released two launch graphics. First up, for those who know the only way to ride is with the throttle fully open to the stop, is the Bell MX-9 Pinned Helmet. With a classic white base, the Pinned paint scheme combines redline pinstriping with a sky blue leading edge around the eyeport. Forget red-hot, this is white-hot. The second release graphic is for urban ‘crosser making a ruckus, tearing up downtown as if it were a supermoto track. 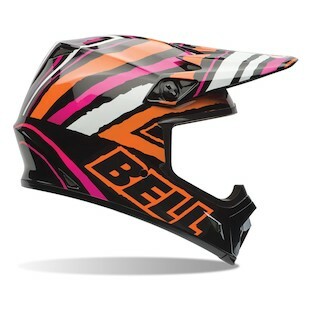 The Bell MX-9 Tagger Scrub Helmet is like a mad mashup between a corner street artist and ‘90s neon. The design is polarizing, but that’s the point. Those in the know will love it, and love the fact that other will absolutely detest it. It’s madd. We are happy to see Bell giving some love to their off-road helmet line-up after a few seasons of upgrading their street bike lids. The new MX-9 offers a much-appreciated middle ground for dirt riders, and leaves me with the distinct feeling that I winterized my bike a little too soon.